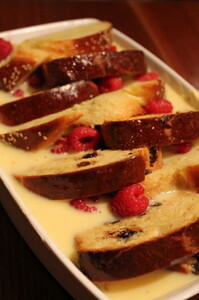 An indulgent version of regular bread and butter pudding. Instead of brioche you could use stollen, panettone or any other enriched bread. This can be made ahead, even the day before, and then baked in time to serve. Cold leftovers can be sliced thickly, fried in butter on each side and served with poached fruits and cream. Yum. This recipe is adapted from that used at the fantastic Tartine bakery in San Francisco, where I used to live. Heat the oven to 170C. Lay the sliced bread on a baking tray and toast until lightly coloured, 5-10 minutes on each side, depending on how fresh the bread is. Afterwards let the toast cool. Meanwhile scrape the seeds out of the vanilla pods and add them and the pods to the milk in a saucepan. Bring to a simmer then turn off the heat and let infuse for half an hour. Generously butter a deep gratin dish, preferably 10″ x 6″. Whisk the eggs with the sugar and a pinch of salt. Whisk in the infused milk, pods and all, then strain through a sieve into a jug. Arrange the toasts in the gratin dish in overlapping layers at a shallow angle. It’s important not to pack the dish too full of bread or the pudding will not be moist, so leave plenty of space for the custard. If using, scatter over the fruit, tucking some between the toasts. Pour over the custard to fill the dish. You won’t be able to get it all in, but after 20 minutes the toast will have absorbed lots of custard and you should eventually be able to add it all. This is important, so give it time. Cover with foil and store in the fridge for several hours or overnight, or bake immediately. It will take around 1 hour from room temperature or 1 hour 30 minutes from cold. Check by poking around in the middle to see if the custard has set. Once it has all just set, the pudding is ready. Let cool for 15 minutes before serving, as it will be easier to cut into portions.